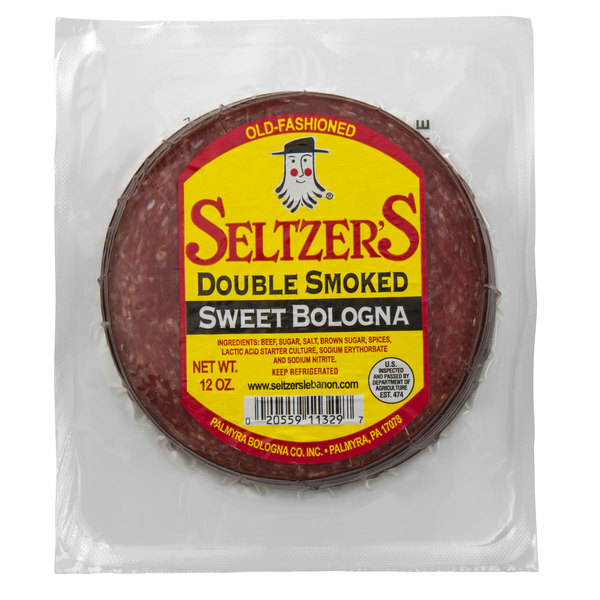 Add a classic deli meat to your kitchen with this Seltzer's Lebanon Bologna sliced double smoked sweet bologna. 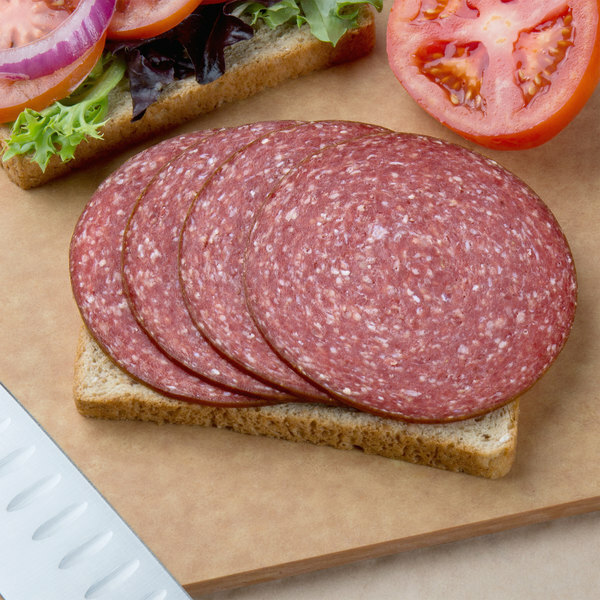 This sweet Lebanon bologna is pre-sliced to reduce prep work in your kitchen, and allows you to easily make made-to-order sandwiches in no time for your customers. Grill or pan fry 1-2 slices for a few minutes until the edges are curled, then top with melted cheese and spicy mustard and serve on a toasted pretzel roll to give new amazing flavor to your classic fried bologna sandwiches. For an easy appetizer or light lunch, roll slices of this double smoked sweet bologna with fresh arugula, juicy tomato slices, and a light spread of mayonnaise or cream cheese for a savory wrap your guests will love. The sweet and smoky flavors of the bologna create a one-of-a-kind combination your guests will rave over. Made of 90% lean beef, premium spices, and white cane sugar to provide a high-quality product, this bologna is perfect for your deli, grocery store, cafe, or sandwich shop. This meat is smoked for 3 days, cooled, and re-smoked for an additional half-day with brown sugar added to it to give an authentic heavy-smoked, yet sweet flavor that your guests are sure to appreciate. 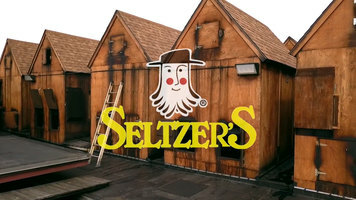 Coming with 14 slices per each 12 oz. pack, this bologna is also great for merchandising at your deli or convenience store for your customers to purchase by the pack, making this bologna an extremely profitable item no matter how you sell it! 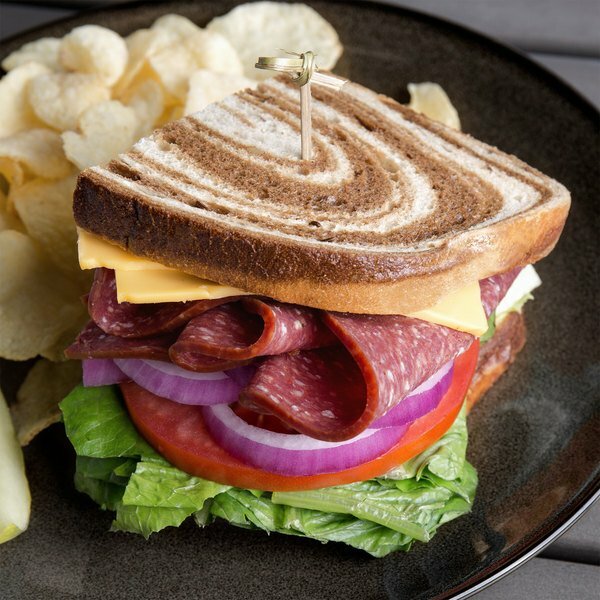 Whether serving in your hot or cold sandwiches, this double smoked sweet Lebanon bologna promises to redefine the traditional bologna sandwich for your customers.